The Department of Computer Science and Engineering of University of Asia Pacific (UAP) launched a 5-day "Mobile Application Training" on January 16, 2014. Nazrul Islam Khan, Secretary of the ministry of ICT inaugurated the training while a total of 40 students from UAP and other private universities participated. Students will learn details about Java and Android applications, throughout the training, he said while addressing as chief guest. Referring a projection, Professor Jamilur Reza Chowdhury, VC UAP said the present software industry of Bangladesh will hold 160 billion dollar world market in 2016. It will further help in heightening foreign remittance and will also attract international investors, the VC added. Enhancing awareness about ICT and to develop expertise for mobile application across the country, UAP launched the training program, conducted under the project of '64 District Mobile Application Development Program' of the Ministry of ICT. The training would lead to connect the international mobile applications market, speakers here said. Students will receive certificate after completion of training. Ethics Advanced Technology Limited (EATL) is the implementing partners of this National Program. The project includes mobile application idea generation contest, mobile apps idea collection: apps sensitization-boot camp in all the 7 divisions, digital content creation for teaching, apps development training in all the districts and lastly a national mobile app championship. 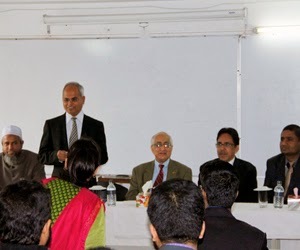 Dr. Mohammad Abul Hasan, Deputy Secretary and Project Director of MoICT, Pro-VC of UAP Dr. MR. Kabir, Md. and CEO, EATL MA Mubin Khan and Dr. Nizam Uddin Ahmed respectively and chairman of CSE Professor Aloke Kumar Shaha were present in the program among others.